Able to survive harsh winters, lean as bison and paleo diet-friendly, the yak is turning heads among American carnivores. Thirty years ago, there were virtually no yak in the United States, and just a handful on exotic animal farms in Europe and huge ranches in Canada. Today industry members estimate there at least 7,500 of the animals being raised in North America, from Alberta to Tennessee. Yak farmers are supplying specialty restaurants, co-ops, and butcher shops with a grass-fed bovine meat as lean as bison. Ranchers like the Nebraska-based Tim Hardy raise yak as seed stock for others – and they’re seeing growth. A former professor, Hardy got into the business three years ago after researching livestock that would thrive on Nebraska’s Pine Ridge. An October blizzard killed countless Angus cattle near yak farmer Tim Hardy – but didn’t faze his yaks. When an October blizzard killed countless Angus cattle near him but didn’t faze his yaks, he felt vindicated. Now Hardy has 60 yaks and plans to expand to 200. In the meantime, he’s been selling some of his animals to farmers in places like Ohio. “There’s definitely been a growth spurt in the past five years, and a dispersion geographically,” says Jim Watson, president of the International Yak Association. The association started in 1992 with 15 member families; recently it hit 100. Watson himself has been raising yak since 2001 in Montana. Western states like Colorado have been yak strongholds since he started, Watson says. But now the association is also seeing coastal growth in states like New York and Vermont, as well as Northern California and Washington. One Texas rancher is even raising yak near Dallas-Fort Worth, although the shaggy animals perennially struggle with the heat and humidity. Yak thrive in snowy winters, prefer arid and windswept plains, and need little shelter. 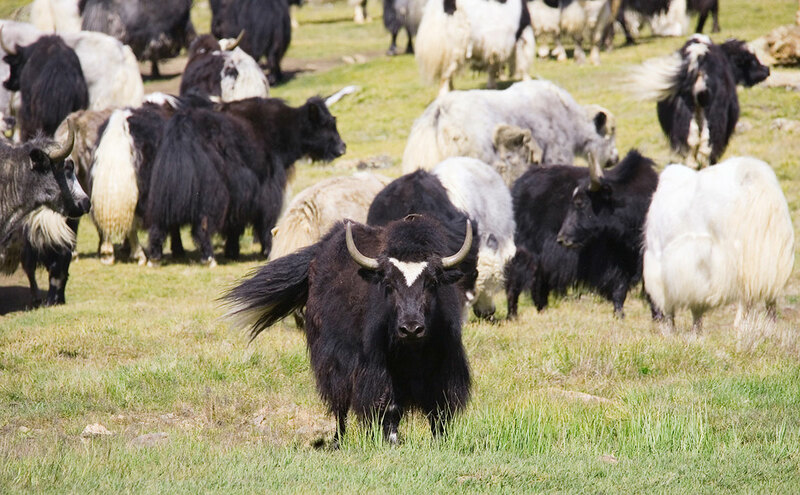 Yak originated on the Tibetan plateau, where they have long been used for wool, meat, and pack-carrying. Wild yaks were domesticated by the Qiang people of the Qinghai-Tibetan Plateau around 4,500 years ago – the last livestock in the world to be domesticated, according to National Geographic. The Qiang drove yaks to mate with cows in high summer pastures. After Westerners spotted yak during their travels, they were brought to zoos places like Paris, yak historian Dianne Latona has found. Around 1908, naturalist and Boy Scouts co-founder Ernest Thompson Seton had the idea that yak would thrive on North American prairies, too. He arranged for nine to be brought from Mongolia and donated to the Canadian government. Canada experimented for years with their breeding. When those experiments were abandoned, many of the remaining yak slipped into area ranches in Alberta, Latona says. By the ’80s and ’90s, a few U.S. exotic game ranches had imported a handful of yak, too. Around 1997, the breed had a breakthrough when yak began to be shown at the National Western Stock Show, the self-touted “Super Bowl of livestock shows” held yearly in Denver. Awareness of what yak farmers call the “mountain cow” or “grunting ox” has been chugging upward since. Its reputation as calmer than bison and smarter than cattle helps. Nationally, ground yak meat goes for up to $10 per pound now, and quality animals average upwards of $2,500, association president Watson says. Yak numbers are still nowhere near those of bison. The U.S. herd is estimated at 220,000 by the National Bison Association. Bison meat sales totaled $278 million in retail stores and restaurants in 2011, the association reported.